The creatures that inhabit a fantasy world are many and varied, and while great dragons, fierce orcs and sneaky kobolds may be the most well known, they are not, by any means, all that there is. There are water-dwelling abaias and altamahas, frightening undead apparitions and drekavacs, sneaky likhos and redcaps, and terrifying spearfinger hags and wendigo. Let this tome be your guide to each of them, and more. 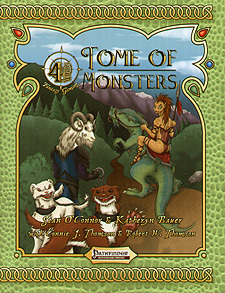 The Tome of Monsters details 123 different monsters and animals, and includes information for creating another 29 variants of some of those creatures. Among the creatures are several templates and four playable races, and most of the animals include stats for using that creature as an animal companion or a familiar. In addition, the creatures and monsters are beautifully illustrated by some of the best up-and-coming artists in the gaming industry. GMs and players alike should find this book an interesting and invaluable tool!